This February 22, the Chilly Hilly may only live up to half of its reputation. Unlike years past, the Chilly Hilly-a 33-mile community bike ride that draws crowds from across the globe-is scheduled for a day that boasts a sunny, 55-degree weather forecast. Chilly Hilly veterans-some of whom have embarked on this crazy ride since its origin 43 years ago-and first-timers can ditch the Gortex rain gear for colorful and whacky costumes to add to the herd of thousands-yes, many thousands!-of cyclists fleeing the ferry or hopping on in their own front yard. 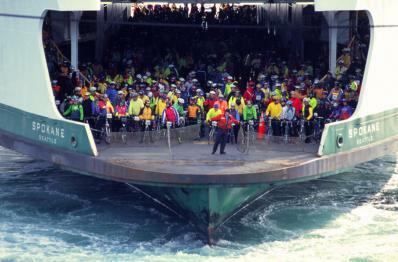 At maximum capacity, the Chilly Hilly has hosted riders from France, Canada, and states all across the country, riding 6,029 strong in 2010! The riders vary in ages too, ranging from toddlers to seniors and all ages in between. For Seattle riders: day-of-ride packet pickup and registration will be held at Pyramid Brewing on 1st Avenue S., with plenty of street, lot, and garage parking in the area. If your bike is on top of your car, avoid parking garages! Your registration includes one beer ticket at Pyramid Brewing Company as well as ferry fair to and from Seattle if you register there. 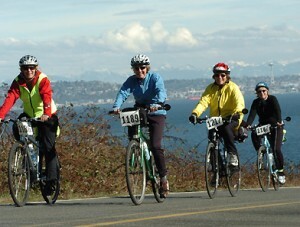 For Bainbridge riders: day-of-ride packet pickup and registration will be held at B.I. Bicycle Shop in Downtown Winslow. Once you reach Battle Point Park, take a break for some free food and refreshments (closes at 2 o’clock), but be sure to save room for the chili feast with vegetarian options and hot drinks at the finish line (closes at 3 o’clock) which benefits a different Bainbridge Island nonprofit each year. Along the way, enjoy the islands numerous coastal and forest parks and pockets of neighborhoods including Rolling Bay, Manitou Bay, Fay Bainbridge, Port Madison, Fort Ward, Grand Forest, Strawberry Hill, Lytle Beach, Lynwood Center, and many more! Register for the event at here and dust off your bikes, costumes, and sunglasses because this one’s going to be a bright and sunny event to remember!